Russell Slade is the fourth-longest serving manager in the top four tiers of English football. Former Cardiff City defender Andy Legg says fans should back Russell Slade if he is appointed manager. The Leyton Orient boss is among the bookies' favourites to replace Ole Gunnar Solskjaer, who resigned after less than nine months in the job. "If he is going to be Cardiff City manager fans have to go and back him," said Legg. Danny Gabbidon and Scott Young are expected to remain in charge for the League Cup match against Bournemouth. Legg played more than 150 games for Cardiff City between 1998 and 2003. 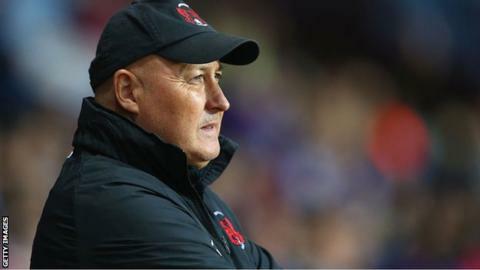 "Cardiff City fans will have to take a deep look at themselves - If it's Russell Slade you've got to give him a chance. "You can't say he's not a name, where has he come from and who is he. You've got to give anybody a chance that comes in. You've got to back them. "They've taken a big step backwards from the Premier League to the Championship. It might take another step backwards before they go forward." He also played at Notts County when Slade was caretaker manager for four months in the 1994-95 season. Legg believes a proportion of Cardiff City fans would expect a higher-profile appointment to replace Solskjaer, but that should not be held against him. "It's always a gamble taking a new manager in, but certainly [Slade] has got the personality for it, and he's done very well at Leyton Orient," said Legg. "He has credentials [even though] he hasn't managed at a higher level. "But perhaps he hasn't managed at a higher level because he's not been given the chance - it doesn't mean he's not capable of doing it." Slade says he is proud to be associated with the job at Cardiff. He led the O's to third place in League One last season, but saw his side beaten on penalties by Rotherham in the play-off final - something which Legg should work in his favour. "Russell Slade was a penalty away from being a Championship manager last year," added Legg. "He's not going to be everybody's choice, but who knows?" Cardiff drew 2-2 with Derby County in their first match since the departure of the former Manchester United striker. One of the Bluebirds goals was scored by Peter Whittingham, who said he was impressed by the way caretaker coaches Gabbidon and Young - both former Cardiff players - had handled the team. "They've treated it really professionally," said the 30-year-old midfielder. "You can tell the boys really wanted to work for them and from that second half performance long may it continue."